With a theme like War and Peace it wasn’t hard to decide exactly what I wanted to make for this month’s Historical Sew Monthly Challenge…especially since it tied in perfectly with this month’s theme. Enter my 1940’s House Dress. Very simple, very sweet, and very satisfying. After last month’s ordeal, I was very happy to find something less stressful. For the past four weeks, I can’t stop my obsession with house dresses. Any kind, from any era, I am head over heels in love. While it did take me a while to settle myself on a style and look, I wasted no time in picking out the most cheery calico I could find! 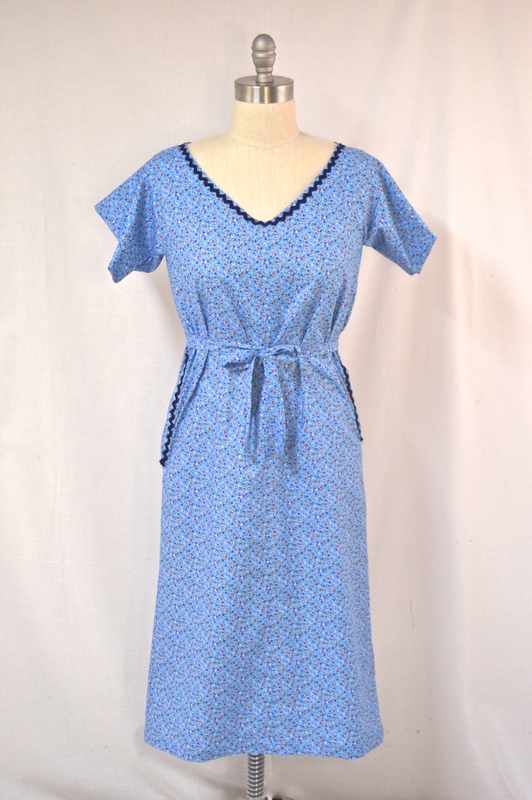 Add this dress with my 1940’s Hair Turban and the look is complete! 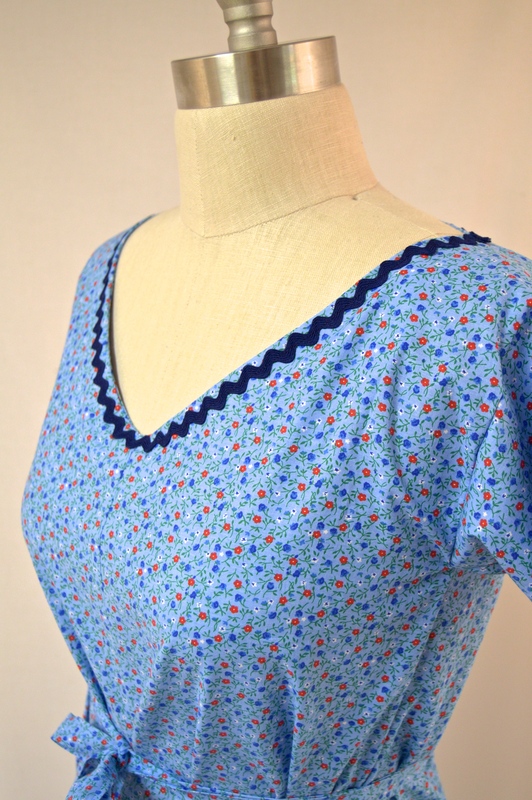 I drafted this pattern out of two pieces then cut out the neckline facing and the lined sleeves. The belt was made from the left over scraps. 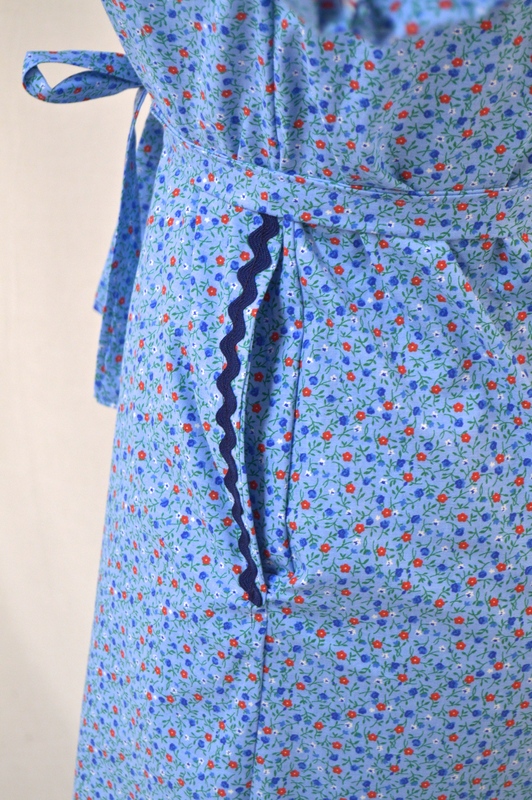 I also added a little rick rack to the neckline and the edge of the pockets…that’s right, it has pockets! While the first few stages remind me of a hospital gown, the outcome is just as simple and clean as I was hoping! Pattern: Self-drafted based off of other house dress of the time….although I did create a slimmer skirt. How Historically Accurate is it? : Although the skirt could be made fuller, the overall look is very accurate. And now for the pictures…. 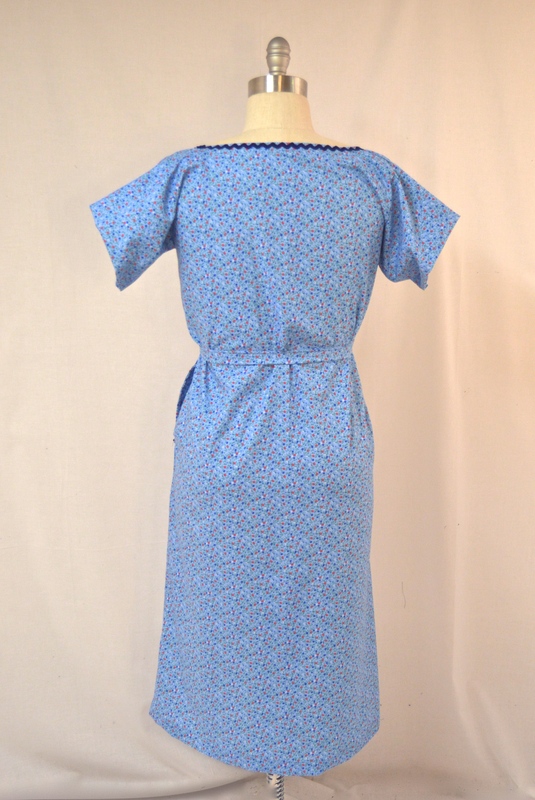 I fell in love with house dresses too when I found my “dress impossible” -a house dress I want to duplicate, but was unable to find a pattern to do so… Maybe once I get my dress form padded I’ll be able to build it on the form. I’d link to it, but if I did, I’d be flagged as spam! 😉 Yours looks so comfortable!